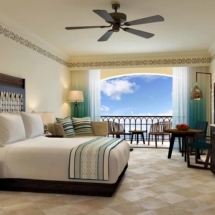 An unforgettable stay awaits at Hilton Los Cabos. 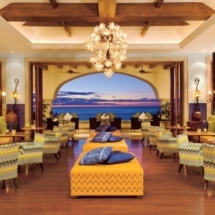 Take in breathtaking views of the Sea of Cortez off your private balcony and bask in the exceptional service we deliver in every detail. Spend your day golfing, fishing, or relaxing at eforea spa before watching the stunning sunset from our iconic infinity pool. 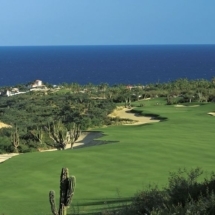 With preferential access to the 18-hole pro-Ocean Course designed by Jack Nicklaus, rated by Golf Digest as one of the Top 50 Golf courses Caribbean and Mexico. With every room and suite offering an incredible view of the Sea of Cortes, infinity pools, sunsets are romantic and the atmosphere is purely relaxing. 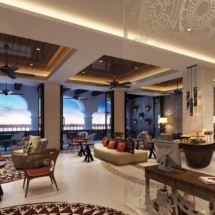 The hotel also has various areas for whale-watching during the ideal season. 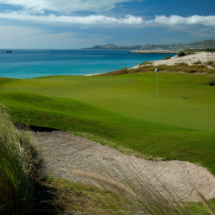 Described by course designer Jack Nicklaus as occupying “the best piece of golf property I’ve ever seen,” the Ocean Course at Cabo del Sol has risen to the pinnacle of Latin American golf since its debut in 1994. Stretching for more than a mile across a stunning desert landscape backdropped by rugged 6,000-foot mountains, the layout, often described as the ‘Pebble Beach of the Baja,’ has seven holes touching a coastline marked by craggy granite outcrops and golden, sun-drenched beaches washed by the turquoise-blue sea. Broad sandy arroyos weave through the interior holes, while giant cardon cacti stand sentinel beside the well-groomed fairways. 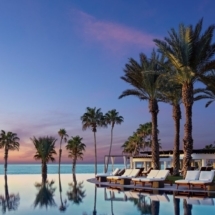 Tucked within a 2,000-acre master-planned resort community on the East Cape a short 10-minute drive from the historic downtown area of San Jose del Cabo, Puerto Los Cabos features a rare composite design by two of the sport’s most legendary figures. At present, the club features two distinctive nines designed by Greg Norman and Jack Nicklaus. (Each nine offers a preview of a future 18-hole layout to be built by each architect). 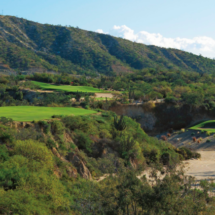 Both layouts are etched into rolling desert foothills backdropped by the Sierra de la Laguna Mountains, with all 18 holes perched high above the Sea of Cortes, the pristine coastline and the resort’s marina. 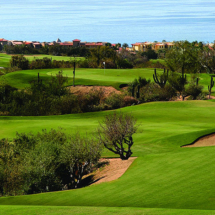 Situated in a box-shaped canyon backdropped by stark brown peaks in the Sierra de la Laguna range, Palmilla is the landmark facility that set the stage for top-shelf golf in Los Cabos when it opened in 1992. The original 18 (Arroyo and Mountain nines), the first Jack Nicklaus Signature Design in Latin America, is a target-style test that skirts boulder-strewn arroyos, long waste bunkers and several ponds. Several holes call for heroic, do-or-die forced carries over raw desert from the back tees, but broad terraced fairways, generous bail-out areas and accessible greens accommodate players of lesser attainment. provide an expansive feel. The 14th hole, at 454 yards, runs along the edge of a steep canyon to a green carved into a precipice at the layout’s highest point—nearly 500 feet above the sea. From an elevated tee, the brawny par-4 18th hole is a classic finishing hole that will force you to navigate the crossing arroyo on the right and the expansive lake on the left. Room Amenities:Our rooms feature oversized living and dining areas, luxurious bedding, cable TV service, coffee machine, stainless steel appliances, full-sized refrigerator, and electronic in-room safes. 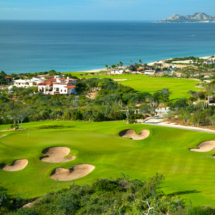 The #1 provider for customized golf vacation packages in Los Cabos.